I had a hard time choosing a picture for this week's "pet faces" theme. I have that stinkin' cute puppy I take a million pictures of... and three cats. 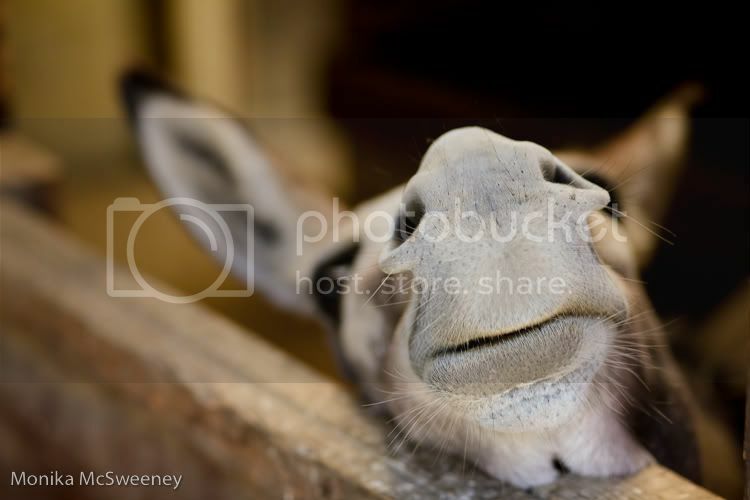 But in the end this donkey face begged to be chosen =). I have a soft spot for donkeys, I can't explain why. My favorite childhood stuffed animal is a donkey, lovingly called "Eseli" (which means little donkey in Swiss German). Anyways, last summer I met the little donkey you see below. He was begging for more dry bread, sticking his soft lips up in anticipation... just too cute for words!!! I hope you think so too =)! For more cute pet faces, click the link below. Maybe even enter your own picture!!! I absolutely love donkeys too! This is a fantastic capture. Love the shallow DOF. This is a great shot!!! LOVE the nose! LOVE LOVE your entry. oh gosh, he is precious. a winner for sure! Ooh such an amazing photo, I love Donkey's too lol! This is hilarious! I love it! great photo! Ahh! Look at all those little whiskers! So cute! wonderful. i love the perspective. such a great shot! this is a great picture! great perspective, very crisp..what kind of camera and lens do you have? its amazzing!